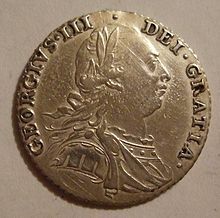 A shilling of George III, king at the turn of the 19th century. The King's shilling, sometimes called the Queen's shilling when the Sovereign is female, is a historical slang term referring to the earnest payment of one shilling given to recruits to the Armed forces of the United Kingdom in the 18th and 19th centuries, although the practice dates back to the end of the English Civil War. To "take the King's shilling" was to agree to serve as a sailor or soldier in the Royal Navy or the British Army. It is closely related to the act of impressment. The practice officially stopped in 1879, although the term is still used informally. A recruit was still entitled to return the shilling until becoming subject to martial law upon formal attestation before a Justice of the Peace. At this point, a more substantial bounty was paid to the new recruit, which fluctuated from two guineas to a high of £23/17/6d in 1812. However, this payment generally was quickly lost to various duties and dues, such as uniform. The monetary amount of this bounty, which might be equivalent to half a year's wages for the average unskilled worker, was enough to persuade most potential recruits to join. Those who hesitated were often won over by making them intoxicated with strong drink. The bounty was lucrative enough for some to repeatedly desert, then reenlist: one man was hanged in 1787 for doing so 47 times. The pay for a private in the English Army was originally one shilling a day. A soldier was expected to pay for food and clothing out of their wages after using the initial sign-up bounty to purchase their initial equipment. It was not until 1847 that a limit was placed on deductions, ensuring that each soldier was paid at least one penny (a twelfth of a shilling) a day, after deductions. Novel incentives were sometimes used to persuade soldiers to enlist in the army. Jane Gordon, Duchess of Gordon was known to tour Scotland with a shilling in her lips for anyone wishing to join up to take. Press gangs had the power to compel British seamen into the Royal Navy. A man forced unwillingly into the Navy in this way was given the King's shilling, but was often offered a chance to volunteer: a volunteer would be eligible for an advance of two months' wages and would be treated more favourably than their pressed counterparts. Clothes and equipment, such as a hammock, had to be bought from the ship's purser out of the advance. Volunteers were also protected from creditors, up to the value of £20. There are recurring tales of sailors being pressed after a shilling was slipped into their drink, leading to glass-bottomed tankards. However, this is likely to be a myth, for the Navy could press by force, rendering deception unnecessary. Joining the British Army is still unofficially described as "taking the Queen's shilling". This includes non-British and Commonwealth soldiers who join the British Army. At least one airman was given the King's shilling upon attestation into the Royal Air Force in 1948. The phrase has been used to refer to other modern practices, for instance to a member of the British House of Commons accepting an office of profit under the Crown, such as the Crown Steward and Bailiff of the Manor of Northstead, in order to vacate their seats, as resigning is not permitted. It has also been used to describe pay and expenses of Members of Parliament. It has been used metaphorically for other activities paid for by the British Government. Employees of post offices that were bailed out have been referred to as taking the shilling, as have Conservative MPs accused of lobbying, unionist militia in Northern Ireland, and judges upon taking office. The term was mentioned in D. H. Lawrence's Sons and Lovers. The term was also mentioned in the BBC drama, Our Girl. The phrase is used in the 1968 song "Butcher's Tale (Western Front 1914)" by the British band The Zombies, which is written from the perspective of a butcher serving on the front lines in World War I. The term is used in the BBC television series Peaky Blinders (Episode 3.6) by the character Thomas Shelby. Addressing subordinates he says, "When you take the King's shilling, the King expects you to kill. ", in reference to killings that he had ordered. ^ "Queen's shilling". Collins English Dictionary. 2011-10-26. Archived from the original on 2014-05-13. Retrieved 2014-05-13. ^ a b BBC Radio 4 (20 May 2003). Making History (Radio broadcast). 23 minutes in. Retrieved 2014-05-18. ^ a b c d "The King's Shilling". BBC History - Fact files. BBC. 2005-01-28. Archived from the original on 2014-05-13. Retrieved 2009-03-30. ^ a b c Paul Gooddy. "The Impress Service". Archived from the original on 2014-05-12. Retrieved 2014-05-13. ^ a b c d e "Making History". BBC Beyond the Broadcast. Archived from the original on 2005-03-15. ^ a b c Robert Henderson (2001). "Taking the King's Shilling: Recruitment for the British Army, 1812". The Discriminating General. Archived from the original on 2014-05-12. Retrieved 2014-05-13. ^ "To take the King's shilling". Upper Canada Military Re-enactment Society. 2004-01-20. Archived from the original on 2014-05-13. ^ a b Coss, Edward (2010). All for the king's shilling the British soldier under Wellington, 1808-1814 (PDF). University of Oklahoma Press. pp. 113–114. ISBN 9780806185453. ^ Francis Grose (1786). Military antiquities respecting a history of the English Army, from the conquest to the present time. Bavarian State Library. p. 413. OCLC 21135023. ^ Nicholas Fairbairn (October 15, 1991). https://www.theyworkforyou.com/debate/?id=1991-10-15a.209.0 |chapter-url= missing title (help). Parliamentary Debates (Hansard). House of Commons of the United Kingdom. ^ "I'll Make a Man of You (Recruiting Song)," words by Arthur Wimperis; music by Herman Finck. Francis, Day and Hunter, 1914. ^ Rottman, Gordon L. (2007). FUBAR : soldier slang of World War II. Botley, Oxford, U.K.: Osprey Publishing. ISBN 1846031753. ^ "Impressment". Royal Naval Museum. Archived from the original on 14 May 2014. Retrieved 14 May 2014. ^ Gee, David (2007-01-07). "Selling the Queen's shilling". The Guardian. Archived from the original on 2014-05-13. Retrieved 2014-05-13. ^ Nick Squares (2003-11-13). "Fighting Fijians flock to take the Queen's shilling". The Telegraph. Retrieved 2014-05-18. ^ "The Chiltern Hundreds" (pdf). Factsheet P11 Procedure Series. House of Commons Information Office. August 2010. Retrieved 14 January 2011. ^ Michael White (2008-08-08). "Removing the oath of allegiance to the Queen would just be window dressing". The Guardian. Retrieved 2014-05-19. ^ Michael Connarty (January 12, 2011). https://publications.parliament.uk/pa/cm201011/cmhansrd/cm110112/debtext/110112-0001.htm#11011258002774 |chapter-url= missing title (help). Parliamentary Debates (Hansard). House of Commons. col. 298. ^ Barry Sheerman (July 6, 1992). https://www.theyworkforyou.com/debates/?id=1992-07-06a.119.0&s=%22king%27s+shilling%22#g125.5 |chapter-url= missing title (help). Parliamentary Debates (Hansard). House of Commons. ^ http://oireachtasdebates.oireachtas.ie/debates%20authoring/debateswebpack.nsf/takes/dail1934020700033?opendocument |chapter-url= missing title (help). Parliamentary Debates (Hansard). Republic of Ireland: Dáil Éireann. 7 February 1934. ^ Atlay, J.B. (1908). "Book Reviews". American Law Review. 42: 935. ^ Lawrence, D.H. (1913). "8". Sons and Lovers . London: Duckworth. LCCN 50048147. I have taken the King’s shilling, but perhaps if you came for me they would let me go back with you.